Oftentimes, moving into a care home becomes the best option for seniors who need care and support. However, some seniors feel hesitant about making the move due to some misconceptions. Don’t let yourself be misinformed. Serenity Empire PCH, a reputable personal care home in Fairburn, Georgia, lists some common care home myths and the truth behind them. Myth: Seniors lose their privacy and independence. Truth: This is perhaps one of the most common misconceptions about care homes. The truth is, we strive to make our residents feel as independent and at home as possible. In fact, we even offer private rooms offering residents with optimum privacy and providing them with the opportunity to decorate and furnish their space with their own items. Furthermore, our caregivers follow each resident’s detailed care plan that outlines what they need assistance with and what they can do for themselves. Myth: All seniors are eventually placed in care homes. Truth: No one should ever feel like they are being abandoned and “placed” away from home. The transition to a care home should be the senior’s choice and is based on a detailed, sensitive discussion with family members. Transitioning into a care home should be seen as a positive transition – not something that is dreaded. While some seniors prefer to age in place, a lot of residents who live in care homes feel happier, safer, and more content in their new living environment. Myth: Living in a care home is boring. Truth: We offer a range of wellness opportunities and enrichment programs to keep our residents active and entertained. Our residents are free to choose activities that they want to participate in. Activities can range from crafting classes, board games, movie marathons, and more. Residents are also free to socialize with others living in the care home while participating in hobbies that they enjoy. 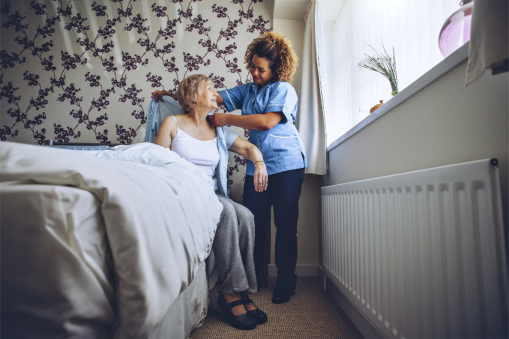 Myth: Care home employees don’t care about the residents – they are just doing a job. Truth: Our caregivers and staff members are truly passionate about making sure that our residents are safe, healthy, content, and happy. We do our utmost best to assist our residents with tasks in a friendly, professional manner. We are here to help our residents live the highest quality of life possible. Don’t let myths and misconceptions prevent you from getting the care that you need. If you are looking for reliable elderly care in Douglasville, Georgia, our care home may be right for you or your senior loved one. This entry was posted in elderly care and tagged enrichment programs, independence, personal care, wellness opportunities. Bookmark the permalink.